Sales of new Mercedes-Benz minibuses and midi-buses, complete renewing, service, accessories, ramps and restraint systems for disabled people, sales representative of OTOKAR buses and Sege seats for the Czech Republic and Slovakia. Buzola Busdesign, Ltd. conducts the unique design, flexibility, individuality, service, speed and quality. Rebuilding and adjustments of minibuses entirely in accordance with customers. Dozens of rebuilding of ordinary minibuses to the comfortable and luxurious ones have been realized by our company in previous years. The company is situated in the Czech Republic, Prague-East. Address: Zděbradská 56, 251 01 Říčany - Jažlovice. Complete remodeling, sale and service of new minibuses and midi-buses, interiors of new generation, attractive design, functionality, quality, comfort, performance and safety. Our company is the first in the Czech Republic, which holds the certificate of EC type global homologation 2007/46/EC for rebuilding minibuses MB Sprinter up to 5,5t (e8*2007/46*0069*00). 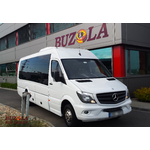 Producing of minibuses that will increase your prestige. Modern interiors from simple to luxurious in accordance with customers.